So my parents took me over to see some horses at a horse breeder's farm because we were looking into buying a few. When I stepped foot out of the car, the very first thing that caught my eye was a 2 year old Morgan horse named Dreamer. Now Dreamer was prancing around holding her tail up high while all the other colts, and Fillies were resting by their mothers. Something about Dreamer's expression when she saw me caught my heart. "Ble-e-e!" Dreamer had exclaimed. Suddenly I noticed a speck of red on her back. I tugged on my mom's arm and said "Look" pointing at Dreamer. My mom slapped my hand away and threw a nasty glance my way. So I just backed down and sneaked my way over to Dreamer. When I saw her at first she backed away showing a large gash on her forehead. I clicked my tongue and called "Dreamer!" very quietly and suddenly the young filly zoomed my way. I examined her back and neck. Large scars and lashes we all over her back! When I gently stroked her back, she whinnied in pain and galloped away. Surprised I took a step closer to her. "Here Dream." I mumbled. The filly held her head low and let her tail drop. Her forelock cleared her forehead and revealed a sharp red hand print! I raced back to my mom who was talking to the breeder and said "Mom! Dreamer has scars!" And my mom immediately looked at me as if I had just uncovered 2 billion dollars! "Now..Um...She was born with that." The breeder said nervously. "There is one shaped like a hand print!" I exclaimed running back over to Dreamer who had lay down on the ground. 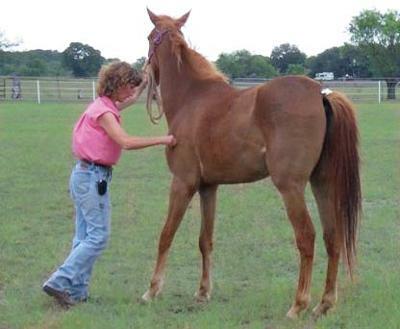 The other fillies and colts looked as though they were very ill. the pasture needed mucking, they were out of food, there ribs showed abnormally, and they were all covered in scars. I begged my mom to let me take Dreamer home to save her but she only glared at the breeder, grabbed my arm,and walked me to the car. "Rayna. Don't say that in front of the breeder. The filly might HAVE been born with that." I threw one more sad pitiful glance at Dreamer. She had raised her head and whinnied towards me. Suddenly she got up and ran towards me! My mom shut the car door and got inside. She started the engine. Suddenly I saw a teenage boy run towards Dreamer and kick her in the leg! "No! Don't do that!" I cried. tears streamed down my cheeks. The boy grabbed her mane and led her into the pasture. "Please! Be careful!' I cried again. the windows were rolled up so they couldn't hear me. The boy slammed the pasture door and locked it. My mom started the car and we drove away. "Rayna I'm sorry. I know you wanted that filly,but a sick horse is a bad horse." I looked at the window and imagined how much pain she must have been in. The next day my mom took me out to several other horse farms, but I said "No I want Dreamer." to all of them. My mom was getting a bit frustrated but I kept on. Finally my mom said "Fine! We'll go back!" and we drove over to the horse farm. "Back so soon?" the breeder asked when my mom got out of the car. Dreamer was looking pretty bad. Her mane was partially gone and tangled, her eyes were bulged and fly infested, and her tail was bald at the top. My ran over to her and clung to her neck. tears streamed my face. Dreamer was off balance. "Mom. Please!' I begged. tears filled my eyes and covered my face. "Please...." "Fine." "WHAT?" "I SAID FINE. Don't make me change my mind!" "THANK YOU!" I screamed racing towards Dreamer. My mom called my dad who came with the horse trailer. "That stupid filly is nothing but trouble. $500. That's as cheap as I'll go." The breeder mumbled. My dad then handed her the money loaded her up and we took her home. "First things first. call the vet." My mom said reaching for her cell phone. We have had Dreamer for over 3 years now,and she recently had 2 foals. Yankee and Magic. (I talk about Yankee a lot) She had fully recovered besides the top of her tail and a few scars here and there. after my mom had called the vet they discovered she had malnutrition, dehydration,and worms. Luckily they cured all. Dreamer is now a happy healthy Morgan horse! What a truly amazing horse rescue story! That "breeder" should be put out of business. I am glad Dreamer found a good home! !